The old saying, "The Luck of the Irish"
"The Luck of the Fryrish", sometimes mistakenly listed as "The Luck of the Fryish", is the thirty-sixth episode of Futurama, the fourth of the third production season and the tenth of the third broadcast season. It aired on 11 March, 2001, on Fox. Fry discovers that he is not the only person by the name Philip J. Fry, and suspects his brother of stealing his name, but in the end he discovers that his brother named his son in his honour. 1.1 Act I: "Get your piping hot horse-burgers!" 1.2 Act II: "Dirt doesn't need luck." 1.3 Act III: "Stop hogging the clover!" 1.4 Act IV: "Allow me!" 1.5 Act V: "I should be the one in that grave!" Act I: "Get your piping hot horse-burgers!" In Old New York, sometime in the 20th century, Mrs. Fry is in labour. However, her attention seems to be on her portable radio, which is tuned in to a Metswinning the world series. Yancy Fry, Sr. names the child Philip, after those screwdrivers. Yancy Fry, Jr. is jealous of the name, but his father informs him that he's named after a proud line of Yancy Fry's. Yancy Fry, Sr. leaves the room, and Yancy steals a rocketship from a mobile hung over Philip's crib. Back in the year 3000, the crew is attending the horseraces. Fry does horribly with his bets. Amy is with her parents in the luxury box, and, in their constant quest for grandchildren, they attempt to set up Amy with their best jockey. Leela and Hermes go to the concession stand, where they encounter a paper-hatted salesman, for some horse-themed (and horse-derived) food. Meanwhile in the stables, Bender is drugging the horses with a hypo-spray. He is interrupted by a jockey, but drugs him as well. Fry prays to the horse-god in hopes of winning the final race, but his horse falls asleep due to Bender's drugging. Fry proclaims that he'll hold on to his last dollar, which then blows away. It lands on a power line, and after Fry is unable to reach it, he tries again with a rake. But lightning strikes the rake and electrocutes him. He seems only slightly hurt, but lightning strikes twice, knocking him from the telephone pole. He lands in a garbage can, and the concession stand cook dumps trash on top of him. Act II: "Dirt doesn't need luck." In the past, Philip and Yancy are having a one-on-one game of basketball, where Fry is doing poorly. However, when sent to retrieve the ball, he finds a seven-leaf clover. After tucking it into his wristband, he makes an amazing shot and Yancy storms off. In the year 3000, Bender counts his winnings from fixing the race, and Fry's head is still smoking from the lightning strike. 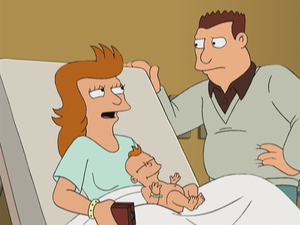 Fry mentions his clover to the crew, and a wig-robot arrives with Fry's replacement hair. Zoidberg suggests that maybe the clover is still in the place he left it, so Fry plans to enter the ruins of Old New York to look for his clover. He recruits the help of Leela, who he'll need to bend the bars which might be blocking the tunnels. Bender, however, points out that "bending" is his middle name—Literally. Together, Fry, Leela, and Bender climb down a manhole to the ruins. Act III: "Stop hogging the clover!" Walking through the ruins of Old New York, Fry does the things he could never do before. Like proclaiming that Howard Stern is overrated, leaving payphones off the hook, and jaywalking. Though this last is foiled by a large lizard trampling Fry. In the past, Yancy and Philip are trying out for a breakdancing troupe, who wish to win a competition, which gives parachute pants as a prize. After Philip's tryout, Yancy does the exact same routine, with poorly-disguised names. To show up Yancy, Philip performs the septuple headspin, three more rotations than the previous record. Yancy then attempts to steal the clover from Philip, but Philip runs home. Fry determines to get his clover back, and assumes it might still be at his old house. In the ruins of Old New York, Bender mounts the subway tracks and Fry and Leela hop aboard. They arrive at Newkirk Avenue, a station in the Flatbush section of Brooklyn. While walking through Fry's old neighborhood, Fry reminisces about the past, and meets one of his old neighbors who has turned into a mutant. They arrive at Fry's old house, which, although in horrible condition, seems to have survived the alien attacks without damage (or at least, without further damage). Philip arrives home with Yancy in hot pursuit. Philip tries telling his mother, but she is, as usual, distracted by sports (this time, golf). Philip goes into the storage room/bomb shelter, where he hides the clover inside the sleeve for the Breakfast Club soundtrack, which is in turn locked into the Ronco Record Vault. Fry, Bender, and Leela enter the storage room, and after the lock on the vault proves to be jammed, Bender opens it by oscillating on the structural resonance frequency of the vault. But Fry finds that the clover (as well as whatever else was hidden within the record sleeve) is missing. They leave Fry's house in defeat, but before they can leave the ruins of Old New York, they come upon a statue resembling Yancy, but with an inscription reading "Philip J. Fry"—and Fry's seven-leaf clover in his lapel. In rage, Fry strikes the statue, injuring his hand (Fry rants "He stole my life... and he broke my hand! ", to which Bender quips "His legend lives on!"). Act V: "I should be the one in that grave!" Somehow, they bring the statue back to Planet Express, where they learn about the person immortalized by the statue. A video on the internet shows Philip J. Fry's life. After a string of good luck, including being the first person on Mars, it is shown that he was buried with the clover, so it could bring him luck in the next life (perhaps, some Egyptians believe). Fry decides they should go to the cemetery and dig up the body to retrieve his clover. In the past, Yancy prepares for his wedding, putting on the camouflage tuxedo that his father wore in Vietnam. While looking for music to play at the wedding, Yancy forces the lock on the Ronco Record Vault, and finds the Breakfast Club soundtrack. Inside it, he finds the seven-leaf clover. On the Orbiting Meadows National Cemetery, Fry, Leela, and Bender arrive at the gravesite, and begin digging. While digging, Fry knocks loose a chunk of moss from the tombstone. Back in the past, Yancy and his wife are cuddling their newborn child. Yancy pulls the clover out of his pocket and gives it to the child. Yancy names the child Philip J. Fry, in honour of his lost brother. 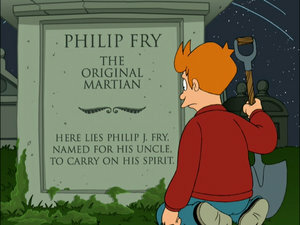 While Fry is reading the inscription he uncovered ("Here lies Phillip J. Fry. Named for his uncle, to carry on his spirit"), realising the grave is not his brother's, but his nephew's, Bender strikes the casket and emerges with the clover (and his wedding ring). Leela, however, understands that Fry needs a moment alone, and sets off with Bender. 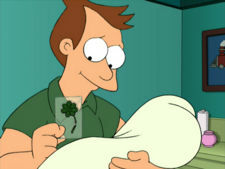 Fry tearfully replaces the clover in his nephew's grave and smiles. This episode is noted as a fan favorite because of its dramatic ending. It was named #11 on IGN's list of top 25 Futurama episodes and #1 on TV.com's list of top 10 Futurama episodes. After one of the races, Professor Farnsworth tears up his ticket exclaiming "You changed the outcome by measuring it! ", a reference to the observer effect. Fry's line, "It's cloverin' time!" is a reference to the Fantastic Four's The Thing, whose catchphrase is "It's clobberin' time!". Interestingly the Thing hails from a fictional street in New York called Yancy Street. The hypo-spray Bender uses is modeled after the ones on Star Trek. The drug Bender uses on the horses is "Comatonin". The closeup of the manhole was the logo for the Fox show, "The PJ's", who reciprocated by putting a picture of Fry on a milk carton in their show. The "people hose" placed duplicates of a character in the stands at the races, but she's probably just a clone, or maybe even a twin. When rummaging through Fry's belongings, Yancy pulls a banner out that says "Whitefish". This is a call back to the episode "Mars University" in season one when Fry states that he is a dropout of Coney Island College and shouts, "Go Whitefish!" "Coney Island whitefish" is slang for a used condom, specifically ones that have been discarded on beaches. Yancy Sr. tells Yancy Jr. "your name is Yancy, just like me and my grandfather and so on. All the way back to minuteman Yancy Fry, who blasted commies in the American Revolution." It is believed that Mildred pretended her child was Enos' son and named it after Enos' father due to the difficulties she would otherwise have had in the 1940's as the mother of an illegitimate child. "Yancy" was also the middle name of Douglas Yancy Funnie, the eponymous character of the early-1990s Nickelodeon cartoon Doug. Doug was voiced by Billy West (in fact, Doug and Ren and Stimpy were the first cartoons Billy West did voicework for); both West and the guest voice of Yancy Jr., Tom Kenny, voice acted for many 1990s Nickelodeon cartoons. While in Old New York, Fry announces "Howard Stern is overrated." Billy West, the voice of Fry, worked on the Howard Stern Show from the 1980s to the mid-1990s. The narrator in the movie about Phillip J. Fry is voiced by Tom Kenny who also happens to voice Yancy Fry. Fry, Leela, and Bender get off the subway line at the Newkirk Avenue subway station, implying that Fry's 20th century home is in Flatbush, Brooklyn, Old New York. The newspaper dispenser Fry stands on has a New York Post reading "MAYOR PREDICTS VICTORY OVER ALIENS". One of the tombstones in the Orbiting Meadows National Cemetery reads "Tomb of the Unknown Comic", a reference to "Tombs of the Unknown Soldier" and comedian Murray Langston, who rose to fame in the 1970s as "The Unknown Comic". The song at the end of the episode is Don't You (Forget About Me) by Simple Minds, which is the most notable song in The Breakfast Club soundtrack. Inscription on tombstone: Here lies Philip J. Fry. Named for his uncle to carry on his spirit. Bender: You're twice the the he ever was! Professor Farnsworth: Dirt doesn't need luck. Race Track Announcer: And it's a dead heat! They're checking the electron microscope. And the winner is number 3, in a quantum finish. Professor Farnsworth: No fair! You changed the outcome by measuring it. Fry: I'll tell you when my horse finishes... Bad. Fry: Leela. Bender. We're going grave robbing. This page was last edited on 6 October 2016, at 03:07.